Shane Ortega walked into the Americana Ballroom at the Loews Hotel Friday morning, with an enlightened mind, but a burdened heart. The two-spirit activist and retired Army Staff Sergeant carried the thoughts and memories of 14 fallen brothers and sisters that they had known through two combat tours in Iraq and one in Afghanistan. In 2014 the World OutGames secured a $200,000 grant from the Florida Sports Foundation. But a year later the FSF board grew concerned OutGames was not meeting fundamental benchmarks, such as locking in and securing sites for events. A global sporting goods brand has joined forces with the 10-day global human rights and cultural event in Miami. The Wilton Warriors will live on to play another day says team captain Chris Manning. There will be games to be played this time. Chris Manning guarantees it. When, at 19 years old, Deondre Moore told his mother he was HIV-positive, she begged him not to tell his story. Deondre calls himself a mama’s boy. And at the World OutGames on Saturday, he had the slideshow to prove it. Moore told visitors about his life back home, focusing on faith, support, and family. Amidst the drama of the last-minute cancellations of sporting events and ceremonies, the Human Rights portion of the World OutGames Miami is still chugging along, with panels taking place over the weekend. The World OutGames is a combination of human rights, cultural and sporting events that seeks to unite and celebrate LGBT communities from around the globe. Athletes from South Florida and around the globe converged in Miami this week to compete in the 2017 OutGames and try to claim glory in their respective sports. They’re coming from as far as Australia and Tonga and as near as Cuba and our own Florida International and Florida Atlantic universities. Beginning Friday May 26 through Sunday May 28, human rights activists, researchers, scholars and advocates from around the world will gather in Miami Beach for the fourth Global Human Rights Conference as part of the 2017 World OutGames. Nadine Smith knew she was gay from a very young age. Possibly because her third-grade girlfriend “Amber” told her so. – Not that she was gay, just that she was in fact, her girlfriend. Despite complete chaos, a criminal investigation and other hiccups, the aquatics events of the World OutGames went on as planned Saturday, one day after the board of the organization announced that the majority of sporting events would be cancelled due to financial troubles. 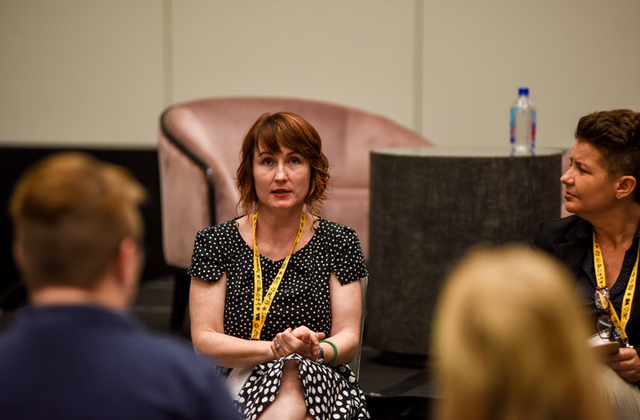 The World OutGames Miami opened with its ‘Global LGBTQI Human Rights Conference’ Friday morning, May 26 at the Loews Hotel in Miami Beach. But by Friday afternoon, the conference was overshadowed by an email from WOG organizers that the sports programming and related ceremonies, scheduled to begin Saturday had been cancelled due to “financial challenges. The last-minute collapse of the OutGames in Miami is a disgrace that its Board and directors will never live down. When the World OutGames canceled their 10-day sports festival on the opening day it left thousands of athletes shocked, bewildered and angry. This year’s World OutGames Miami 2017 will include a special Pulse memorial. Welcome to SFGN’s special World OutGames Miami 2017 section. We’re highlighting the stories of local LGBT athletes that will be attending this year’s event from May 26 through June 4. While we couldn’t cover all the over 100 local athletes, we’ve decided to feature players from a wide range of the sports that will take place at OutGames.